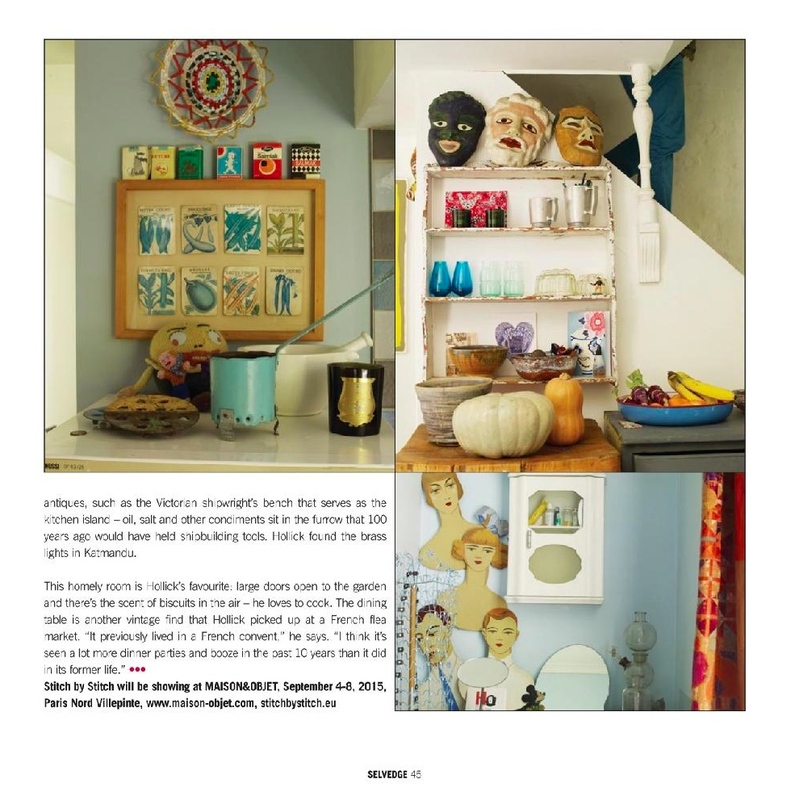 The definitive magazine for textile-lovers, Selvedge, recently paid a visit to Stitch by Stitch founder Graham Hollick's "eclectic, imaginative and unexpected" East London apartment. We're delighted to be able to share the article with you here. This will appear in print in the July "Pop" Issue no.65. "There are intriguing objects everywhere...."
"Colour is a big thing for me...but never really strong colours" says Graham. "Stitch by Stitch collections evolve gradually, blending respect and admiration for traditional skills with a knowledge of what will stimulate demand"
A "Victorian shipwright's bench serves as the kitchen island - oil, salt and other condiments sit in the furrow that years ago would have held shipbuilding tools." Elsewhere in the press recently, our indigo Desi Pom Pom blanket was featured in House and Garden's July issue (item 3 on the jolly elephant's back, below). And Elle Decoration did a nice little piece on our work with kala cotton hand loom weavers in Kutch, India, in April. Read more of our press coverage. We'd love to have you in our address book!